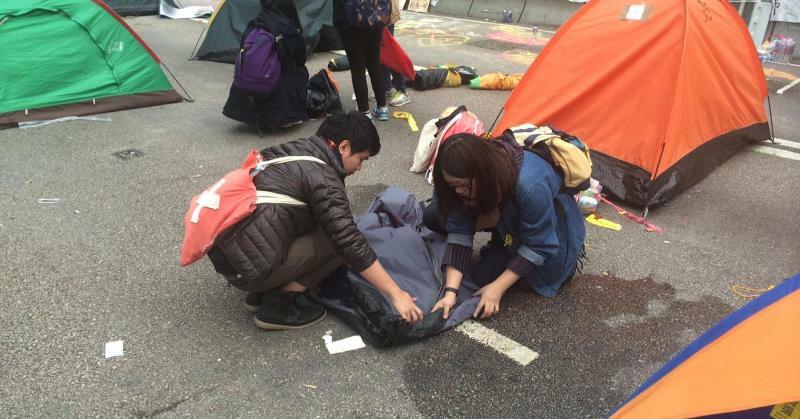 After 75 days of occupation protests, Hong Kong pro-democracy demonstrators began packing up their tents and belongings in the main camp site near government headquarters early Thursday ahead of an 11am deadline set by police. Police began clearing out the site around 9am, warning that protesters who refused to leave at 11am would be arrested. More than 7,000 specially trained police officers have reportedly been deployed for the mass clearance. The mood on the ground was a mixture of defeat and determination. Despite the looming deadline, Alex Chow, secretary-general of the Hong Kong Federation of Students, was determined to stand his ground as police clear the site. "There will be a group of people resisting till the [end]. The reason we still choose to stay here when the police start their clearance, is we would like to demonstrate the whole spirit is based on civil disobedience," Chow told CNBC. Asked whether the pro-democracy movement has been successful he said, while there haven't been concrete achievements, it has helped raise a great deal of awareness about political and social issues among Hong Kong citizens. "It has changed the culture of Hong Kong and its people," he said. While the clearance has been peaceful thus far, some student demonstrators were preparing for the possibility of tear gas or pepper spray, wrapping their faces for protection. Hong Kong Chief Secretary Carrie Lam on Thursday said she could not guarantee that there would not be any confrontations. "Knowing there are some radical elements among the protesters, confrontation might become inevitable," Lam said, as quoted in the South China Morning Post. Pro-democracy protests in Hong Kong began at the end of September after Beijing said it would screen candidates for city's leadership election in 2017. The rallies involved more than 100,000 people at their peak, but participation has since tapered off. As the occupation chapter of the protests comes to an end, the question is what lies ahead for the historic movement. According to Alan Hoo, chairman of the Basic Law Institute, the movement may have hit a dead end. "At the moment, what the students and protesters want is an official dialogue. They don't just want a platform to discuss, they want official action that will produce results and bind the government," he said. "The government is not going to do that." The sentiment was more optimistic among student protesters, who erected a large yellow banner with the words "we'll be back" in the center of the highway where they camped out.